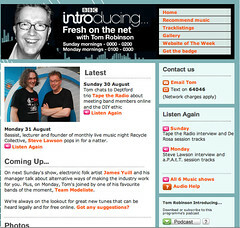 A couple of weeks ago, I was interviewed by the wonderful Tom Robinson for his show on 6Music, ‘Introducing‘ – a show all about new music with, rather brilliantly, lots of handy tips for bands and artists starting out and trying to negotiate the tricky transition from the age of the mega-deal-at-the-end-of-the-rainbow to the scary world of DIY and talking to your audience. He’s previously featured my site as website of the week (I wrote about that here), but this time I was a guest in the studio, chatting and I got to play an awesome tune by Ryan Scott as my new music choice. Three, twitter is the best way to have day to day communication with your audience. If you sent out 15 email newsletters a day, you’d be getting people blocking you as spam, if you do that on twitter people interact. Four, crowdsource opinion – that’s different from allowing your audience to produce your record but soliciting feedback is a really good thing, people like to let you know what they think of what you’re doing. Five, collaborate with other artists, get as many people together, form collectives – officially or unofficially – and promote one another, cos that’s where the Karma comes from. One – promote others because if you take an interest in them, they might take an interest in you. Use the social networking tools available on the internet to spread word of your favourite independent artists and because we all like to see what people say about us they will probably somehow find your link and want to know who you are! Two – organise shows and be proactive in creating work for yourself, don’t rely on promoters to come to you. Be your own promoter, find unusual places to play and ask other artists to come and play too. It’s amazing how often they will say yes! Three – don’t just think music, collaborate and communicate with artists from other artistic spheres. For example on my last record I collected photos from 12 different photographers all over the world – this gave them an interest in my work and encouraged them to promote it from Argentina to Denmark and New Zealand. And they were flattered that I wanted their involvement. I’m currently doing the same with a music video. People in the other arts are just as interested in working like this as we are in music! Four – creative clusters and involvement in a local scene is key for any artist wanting to establish a primary base. The Internet is great but can’t beat getting stuck into a face-to-face local music community. Where there’s community there is genuine support and encouragement for when you look to branch out and a safe place to come back to if things don’t go to plan. Five – be yourself, it sounds cheesy but don’t try to imitators of previous successes, rather strive to be innovators of future success. You can use ideas and platforms that others have used but the great thing about this line of work is there are actually no written rules. Just be yourself and let your imagination run wild you never know what you might come up with, don’t get too bogged down in detailed ‘how to make it in music’ blogs and books. If you’re going to use these online tools, and there’s every reason too use them, engage with them fully. 1: Use analytics tools to find out who is following you/watching your videos/reading your blog. If you have lots of fans in Bulgaria maybe you should tour there? 2: Learn from other bands on the web. Who’s doing cool stuff? Watch what they do, follow their feeds/streams and copy what will work for you. 3: Create associations with similar bands. There is safety and strength in numbers. The point of similarity could be artistic, geographical or social but join together, help each other and have fun together. 4: Give stuff away often. Give your fans/followers cool things, pictures (to print or put on a t-shirt transfer), audio, balloons or anything they might enjoy. Lots of companies will give you free/cheap samples of t-shirts, pens and so forth with your logo or some other branding on them. Give things away periodically rather than in a flood. Folks will come back for cool stuff. 5: Keep doing what’s working already, gig, record, busk but document the process and tell your followers where they can see/hear you. Some of these points are similar to Steve and Andy’s. The main thrust seems to be link up with other artists as well as “fans” and tell your story. Oh and Steve’s first point is essential. Do that now if you haven’t already. Don’t do stuff or not do stuff only based on someone else telling you it was a good idea or a bad idea. Do it your own way.